There is a story about an old village in Spain. The people of this village heard the king planned to visit there. No king had ever done that. So naturally, they became excited and wanted to offer a great celebration that would show their adoration and that would honor the king. But what could a village of such poor people offer? Someone proposed that since so many of the villagers made their own wines â€“ very good wines â€“ they could offer that to please the king. And they each decided that they would all take some of their best wine, and combine them as a gift for the king. On the day of the kingâ€™s arrival, they all came to the village square early in the morning with a large cup of their finest wine and poured their offering into a small opening at the top of a large barrel. They were excited to see the king enjoy the best wine heâ€™d ever tasted. He filled his cup from the spigot. And when he drank the wine, to his surprise he tasted only water. Had some miracle-worker turned wine to water? Had someone stolen all of the wine that was meant for the king? No. Each villager had reasoned, “Iâ€™ll withhold my best wine and give water. There will be so many cups of excellent wine poured into the barrel that mine will never be missed.â€ After all was said and done, the king was left with a town full of people who simply went through the motions of showing their love and admiration for him. In Malachi the people of God were just going through the motions of worship and service. Their attitudes were bad and their hearts toward God were hardened. How are you responding to the full and complete love of God for you? How is the understanding of what He has done for us affecting how you live? The Lord begins by telling his people that he loves them. The tone of the book is set in the opening verses. It is their reaction to this love that causes the oracle to be given, and the book to be written. Israelâ€™s reaction to Godâ€™s election is not one of humility or thankfulness, instead they are arrogant and indifferent toward Godâ€™s love and favor. They were chosen among all the peopleâ€™s of the earth to be the receiverâ€™s of His Word. They have been protected from their enemies; winning impossible victories against them. Escaping from slavery in Egypt. Guidance as a pillar of smoke and fire through the wilderness (manna, quail, etc). Even in their rebellion and cycles of sin, the Lord disciplines them, but always brings them back close to Himself. Their plants and livestock prospered. When there were droughts and plagues it was a result of the peopleâ€™s sin, and God always sent a prophet to warn them ahead of time. God sent prophets, judges, and leaders to guide them through difficult times. In spite of this unprecedented display of love, the people say, â€œHow has God loved us?â€ As if all of the historical accounts of his mighty hand were not enough â€“ they wanted more. It is amazing how, even with the presence of God in our lives and our seeing Him work, that we grow complacent and apathetic. We always want more. The Lord then gives and example of Esau and the city of Edom. Jacob (Esauâ€™s brother) sinned against his family, went away, and was disciplined. He then returned home with Godâ€™s love and was able to be restored. 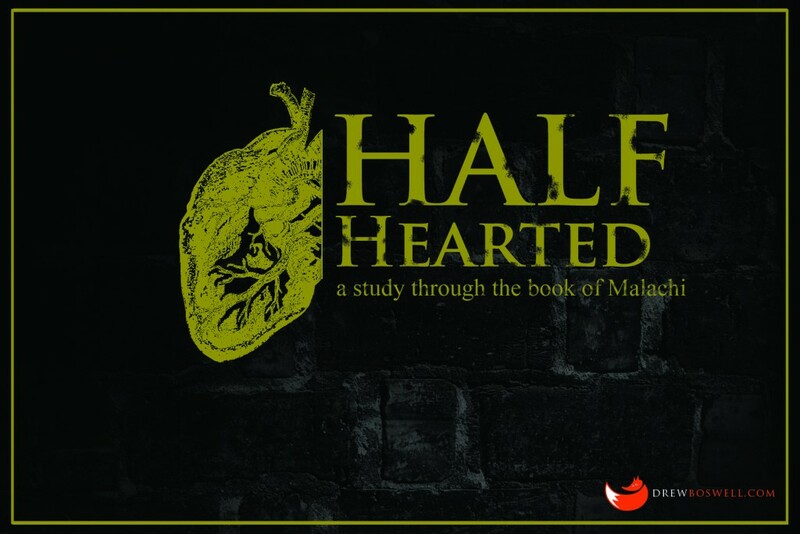 The book of Malachi was originally written to the descendants of Jacob. They were the people that God forgave, disciplined as a child, and loved again and again. Edom were the descendants of Esau. The city was destroyed, whereas Jacob was disciplined but shown Godâ€™s grace and love again and again through the generations. Godâ€™s people are confusing discipline with hatred or destruction. â€œbut Esau I have hatedâ€ is a hyperbole where the author chooses exaggeration to make a point â€“ God favors Jacob so much over Esau that it appears as though it is hate â€“ the difference is so great. Upon returning from exile they are questioning if God loves them or is seeking to destroy them. This doubt and lack of understanding of Godâ€™s love is resulting in inauthentic and insincere worship. Whenever there is ingratitude or a lack of recognition of Godâ€™s love in a personâ€™s life there will be the inevitable moral decline. The only acceptable response to this complete and full love of God for His children is one of whole-hearted obedience and genuine worship. Godâ€™s people are unwilling to see that He has favored them, while rejecting others. Malachi then goes on to show how their worship to Him and relationship with Him is unacceptable. 6Â â€œA son honors his father, and a servant his master. If then I am a father, where is my honor? And if I am a master, where is my fear? says the Lord of hosts to you, O priests, who despise my name. But you say, â€˜How have we despised your name?â€™ 7Â By offering polluted food upon my altar. But you say, â€˜How have we polluted you?â€™ By saying that the Lord’s table may be despised. 8Â When you offer blind animals in sacrifice, is that not evil? And when you offer those that are lame or sick, is that not evil? Present that to your governor; will he accept you or show you favor? says the Lord of hosts. God uses the description of Father and Master to describe his relationship with His people. They should show honor and reverential fear. Instead, their reaction and response to God is to despise His name. The reaction to being told that they are not honoring or showing respect is a demand of proof. They are then given the examples of polluted food and a polluted attitude. The priests regarded the Temple service as a miserable job, and performed it with contempt (i.e. â€œwearinessâ€). They are doing their duty with no attention to important details and with a horrible attitude. They were well aware of the requirements of the law, but were not following it. If they were to behave or do their duties in such a way for an earthly king they know what would happen to them â€“ but they were offering it to the â€œLord of Hosts.â€ The Lord says it would be better to shut the doors and not have worship than to have this parody of true worship. The priests were not bringing the animals to sacrifice, but were allowing the people to offer â€œpollutedâ€ animals instead of their best. 9Â And now entreat the favor of God, that he may be gracious to us. With such a gift from your hand, will he show favor to any of you? says the Lord of hosts. 10Â Oh that there were one among you who would shut the doors, that you might not kindle fire on my altar in vain! I have no pleasure in you, says the Lord of hosts, and I will not accept an offering from your hand. 11Â For from the rising of the sun to its setting my name will be2 great among the nations, and in every place incense will be offered to my name, and a pure offering. For my name will be great among the nations, says the Lord of hosts. 12Â But you profane it when you say that the Lord’s table is polluted, and its fruit, that is, its food may be despised. 13Â But you say, â€˜What a weariness this is,â€™ and you snort at it, says the Lord of hosts. You bring what has been taken by violence or is lame or sick, and this you bring as your offering! Shall I accept that from your hand? says the Lord. 14Â Cursed be the cheat who has a male in his flock, and vows it, and yet sacrifices to the Lord what is blemished. For I am a great King, says the Lord of hosts, and my name will be feared among the nations. In 1 Samuel 13 king Saul is concerned that Samuel the prophet was slow in arriving. While Saul was claiming to seek the favor of the Lord and to have Him go with them into battle, he ignored the proper way of doing it (which was for a priest to offer the sacrifice). Saul is indifferent to Godâ€™s receiving of the act of worship, only in it being done. He seems to see worship as a formality and of having no power; it has to be done before the men can go to battle. He figures he can just slaughter the animals, wave his hands, say a prayer, and get on with the fighting (the real way that they will win the battle). In Malachi 1 the table of the Lord is polluted because the priests do not understand that the favor and presence of God is directly related to the authenticity of their worship. Worship involves sacrifices and a turning of the heart away from the world and toward God. Their reaction to this highlighting of their lack of concern for their worship services is for them to say â€œWhat a weariness this is,â€™ and you snort at it, says the Lord of hosts.â€ This is tedious, tiring, shouldnâ€™t God just receive whatever I give Him? The answer is a clear no. He does not want your leftovers, the second best (that includes time, possessions, family, talents, excitement, energy, etc.) He wants your heart to respond to His love and for your worship and relationship with Him to be real and genuine. The people are returning from exile â€“ the Assyrians had attacked and carried them off into captivity and slavery because of their sinfulness and unwillingness to listen to prophets. God allowed the Temple to be destroyed. Now they have been allowed to return to a desolate land after a period of discipline â€“ they must rebuild everything. But even before the Temple itself is rebuilt their worship has already become hollow. Those who have placed their faith in Jesus Christ are also people who have returned from being slaves and captives. They have been released and are now free to worship their Savior. Their lives have been destroyed, and is even now, being rebuilt into the character of Christ. In the end, the Lord is great and His name will be praised all over the earth. While this may draw the church toward missions and a desire to share the gospel with the world, it is genuine worship that the Lord desires. Missions and evangelism will soon pass, but worship of the Lord will continue throughout all of eternity. The people had just returned from exile and are being challenged to rebuild the Temple (Haggai and Zachariah). The Broadman Bible Commentary, Hosea-Malachi, vol. 7 (Nashville, Tennessee; Broadman Press, 1972) 374. The phrase Lord of Hosts is used 24 times in the book of Malachi indicating the importance of understanding His high place of authority and control of the Hosts of heaven. The New American Commentary, Haggai-Malachi, vol. 21A (Nashville, Tennessee: Broadman and Holman Publishing, 2004) 286.